The Spectrum, in collaboration with the department of statistics, polled nearly 600 students regarding their thoughts on President Dean Bresciani. Nearly three-fourths of polled North Dakota State undergraduate students said they don’t know their university’s president has a pending contract. Over half of the same students also responded they felt indifferent toward President Dean Bresciani’s work and contract renewal. The Spectrum, in partnership with the statistics department of NDSU, conducted a poll last month regarding students’ views on different topics, including Bresciani. The poll indicates 73 percent of students were not aware of the upcoming contract decision. The North Dakota State Board of Higher Education will determine the fate of Bresciani’s contract Wednesday in Bismarck. While indifference reigned supreme, opinionated students largely favored Bresciani. Over one-third of students polled said they approved of Bresciani’s work. Only 6 percent said they disapproved. Student senate passed a resolution supporting Bresciani last month. 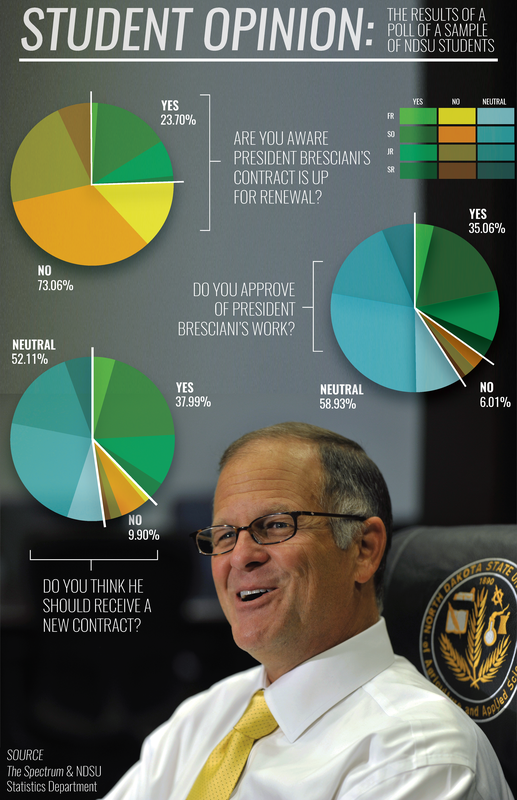 Regarding Bresciani receiving a new contract, the numbers mirrored satisfaction of the president’s work. 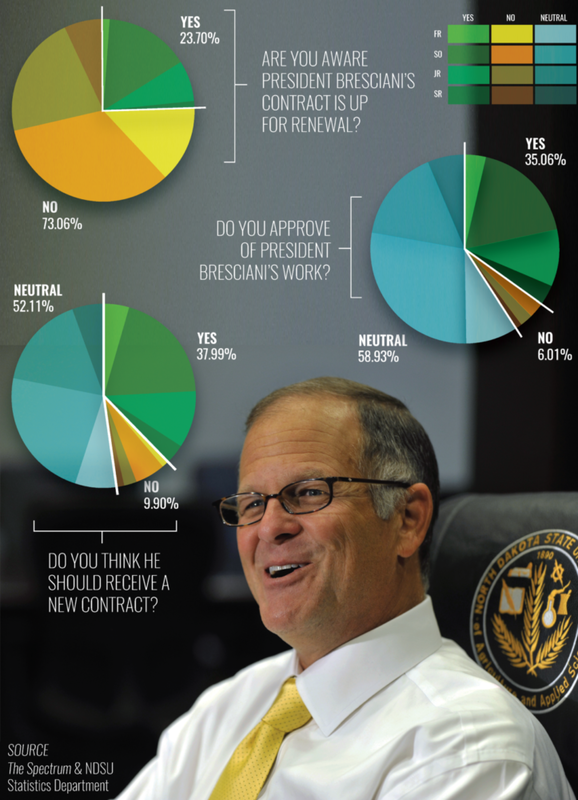 About 38 percent of students polled said they believed Bresciani should receive a new contract. Nearly 10 percent said he doesn’t deserve a renewal. The editors of The Spectrum supported Bresciani’s contract renewal in an editorial published Monday. The polling samples are not exactly proportional to grade sizes at NDSU. Not enough graduate students were polled to list their results. We’ll have more on Bresciani’s contract renewal in the coming days.